Today I’m sharing a delicious recipe for skinny shrimp boil foil packets you can cook either on the grill or in the oven. 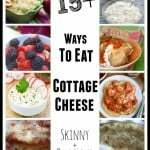 As soon as I spied the recipe in the Summer 2018 Hungry Girl Magazine (affiliate link) I knew I wanted to give it a try. While it took me until nearly the end of summer to give this recipe a go, I’m glad I did. 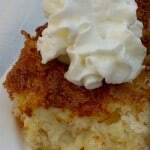 Easy and flavorful, this is a healthy recipe for two I intend to make again and again. How Many Calories/Weight Watchers Points in this Skinny Foil Pack Shrimp Boil? 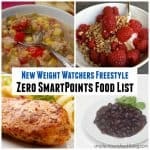 The recipe as written makes two generous servings each with 290 calories and *4 Weight Watchers Freestyle SmartPoints. 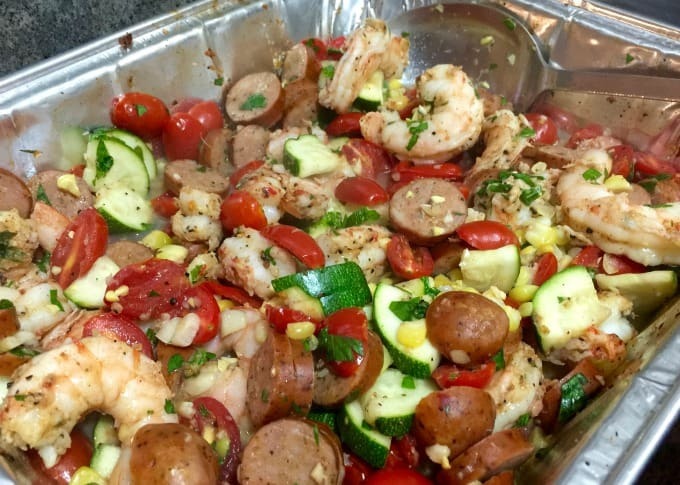 The only ingredient with WW SmartPoints in this low calorie shrimp boil recipe is the sausage. 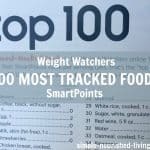 The remaining ingredients are all zero smartpoints foods. Keep in mind that the WW SmartPoints may vary depending on the kind of sausage you use. 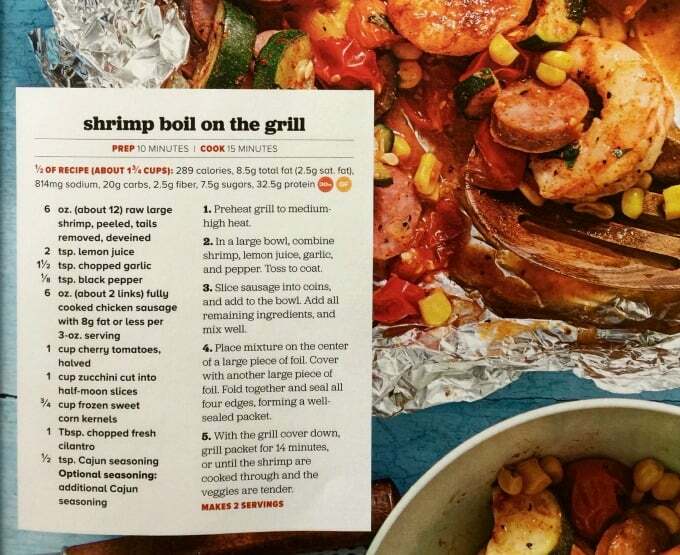 This foil pack low country shrimp boil will work with WW Simply Filling/No Count plan if you omit the sausage. How Many Servings Does this Skinny Foil Pack Shrimp Boil Recipe Make? The original recipe is written to make two servings in foil packet that you place on the grill. You can also place your foil packet on a cookie sheet and bake it in a 425F degree oven for about the same amount of time. Because I was serving four people, I opted to double all the ingredients. I placed everything in a foil pan that I then covered with aluminum foil, set on a baking sheet and baked in the oven until everything was done to my liking, which took about 30 minutes. If you’ve made this Foil Pack Shrimp Boil, please give the recipe a star rating below and leave a comment letting me know how you liked it. Simple and delicious, this skinny shrimp boil packed with an array of colorful vegetables, can be cooked in foil packets either on the grill or in the oven. In a large bowl, combine the shrimp, lemon juice, garlic and pepper. Toss well to coat. Slice the sausage into coins and add to the bowl with the shrimp. Add all the remaining ingredients and mix well. Place the mixture on the center of a large piece of foil. Cover with another large piece of foil. Fold the edges together creating a well sealed packet. With the grill cover closed, grill the packet for 12 - 15 minutes, or until the shrimp and vegetables are cooked through and tender. Place the packet on a cookie sheet and bake in a preheated 425F degree oven for about the same amount of time (about 12 - 15 minutes), or until the vegetables are cooked through and tender. 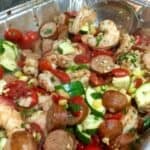 The only ingredient with points in this low calorie shrimp boil recipe is the sausage, so the points will vary depending on the kind of sausage you use. 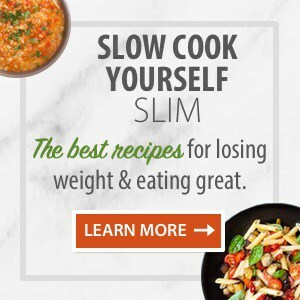 Previous Post: « Weight Loss Success Story – Steffanie H.
Martha, I love getting your recipes and website everyday. I have tried so many, especially soup. As I live alone, soup is an easy go to meal for me. Most of your recipes are done in a slow cooker. 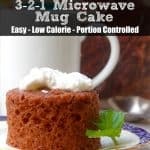 Is thee a way to add the instant pot pressure cooker time to covert your recipes. I am very impatient and I have kind of been winging it on times to cook. Hi Carole, I don’t have enough experience with the Instant Pot yet to suggest times. 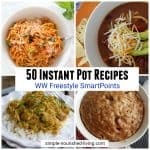 Here are a few great articles I found on converting slow cooker recipes to Instant Pot Recipes that I think can help you: https://www.yourhomebasedmom.com/convert-slow-cooker-to-instant-pot/ https://s3-us-west-2.amazonaws.com/byjillee/printables/ogt-instantpot.pdf https://www.tasteofhome.com/article/how-to-convert-slow-cooker-recipes-for-instant-pot/ Hope these help! Can this be preparein the air fryer? Made this for dinner tonight and it was amazing! I cooked mine in a stainless steel skillet (with the lid on) in the oven for about 30 minutes. Perfect! Served with some Italian bread.